Koreans are known for their fabulous, blemish-free and glowing skin, which is achieved through a unique regimen. It’s a bit more extensive than what you’re probably used to (involving up to 10 steps or more), which can seem daunting at first. Part of the K-Beauty regimen is using face masks to bring out the best in your complexion. Let’s take a look at two different brands that will help you understand how they work to benefit your skin. MEDIHEAL is a company that started in a medical beauty school in Korea. You’ll find several different dermatologists and skin experts at work there that understand the needs of different complexions. The skin on your face is a sensitive area, even if you have a normal complexion. Keeping up with a regular routine is essential for “good skin” but not all skincare products are created equal. You should be selective about the products you choose to clean and moisturize your skin each day. By choosing one of the MEDIHEAL masks, you are one step closer to the complexion you want. 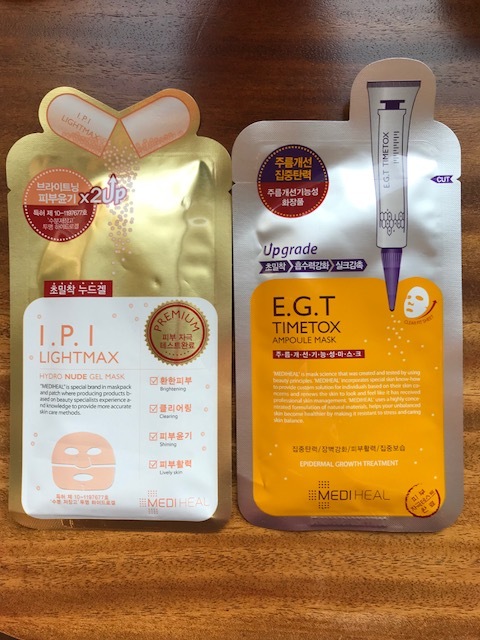 There are many different MEDIHEAL masks, so it might be overwhelming as you try to figure out the best one for you. With different essences and serums, you are on your way to having the best complexion of your life. Ampoule masks are known for their potency, which is incredibly intense. By using one of these masks, you are getting an amplified version of whatever effect you are seeking. You can choose from masks that help to moisturize, whiten, firm, or treat acne. The Essential mask formulas focus on reviving your skin with the nutrients it is missing, like collagen or antioxidants. This category allows you to infuse your skin with many different treatments, like the enzymes from placentas or the extracts from tea tree oil. The LINE FRIENDS masks are all ampoule masks, which means that their effects are incredibly intense as well. This is one of my favorites. All of the formulas in this category have a gel-like feel, which gives you a lightweight texture that is cooling and freeing. These masks are quite soothing for sensitive skin, or skin that needs a lot of correction. There are two different 4D masks, which both use 10 different enzymes to work into your skin on different levels. You can choose between a charcoal or a paper mask, which help to detoxify or whiten your skin.. These masks are made of 100% cellulose, which makes the formulas highly absorbent into your skin. You can choose to moisturize, whiten, or clear up blemishes. Once you know which one of the masks you want to use, then you can focus on treating your skin properly. The MEDIHEAL mask will follow your regular cleanser and toner. Place the sheet mask on your face, and relax for about 30 minutes. You can then remove the mask, but you will need to gently pat in the leftover product into the pores on your face. NATURE REPUBLIC is one of Korea’s most popular cosmetic brands. So far, I like what I see. This K-Beauty product line is dressed up in impeccable, beautiful packaging yet it’s what’s inside that truly matters. And the results are awesome! Rose : moisturize and revitalize skin. Avocado : fills dehydrated skin with ample moisture. Shea Butter : nourishes the skin with a luminous glow. Aloe : soothes irritated skin and makes your skin smooth. Green Tea : deeply moisturizes and helps the skin stay moisturized. Tomato : moisturize and whiten skin. Acai Berry : moisturize and reduce wrinkles. Royal Jelly : provide nourishment and reduce wrinkles. Bamboo : reinforces the skin’s moisture balance. Cucumber: moisturize and make soft skin. Royal Jelly: This is another one of my most favorite masks. 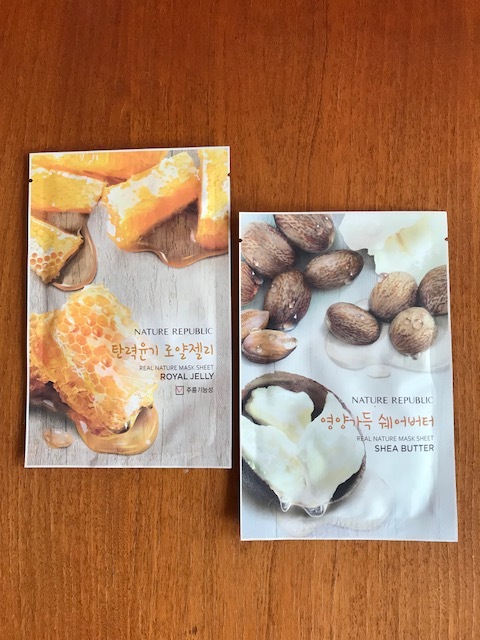 I love the honey smell and the consistency and texture of this sheet mask. The essence is just a little bit oily and sticky although it doesn’t affect the overall performance. My skin feels cool, smooth and supple afterwards. I notice that my skin becomes dewy and glowing after mask application. My skin also appears brighter, smoother, and silkier. So will I buy MEDIHEAL and NATURE REPUBLIC masks again? Absolutely. My complexion has never felt so plump, moisturized and satisfied! I recommend these products for you to try as well. We Koreans know what we are talking about!